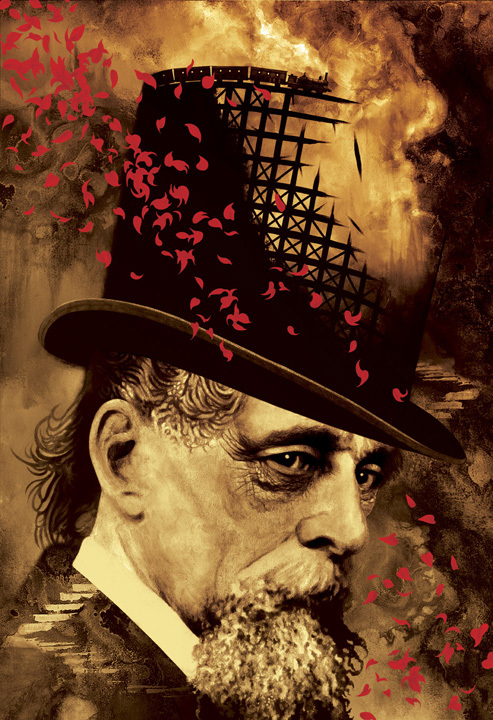 as a fictionalized account of the last five years of Charles Dickens’ life appeal to readers outside of those with Degrees in English. Dan Simmons is one of that select group. Drood is an enjoyable read, that intersperses factual references about Dickens and Wilkie Collins (a lesser known author of the time) with a character either real or imagined named Drood. Whether the Drood character is truly real or is a figment of Collins’ opium delusions (or some other reason which I won’t spoil here) is a large part of the enjoyment of this novel. This novel succeeds on multiple levels, introducing or reminding one of� Dickens’ works and life, introducing the works of Collins, and blending historical fact with fiction in a smooth fashion, quite similar to Simmons’ previous tome, The Terror. I read the traditional Little, Brown and Co. version, but I also most point out the magnificent cover (see picture) that graces the limited edition from Subterranean Press, designed by fellow San Antonian and Northside School District veteran (although my high school was better than his) John Picacio; another excellent cover, John! The novel covers the last five years of Dickens’ life, told from the perspective of his sometime friend, rival and collaborator, Wilkie Collins. It starts with a train disaster in which Dickens is not injured, and proceeds to help as many of the injured as he can. He tells Collins that he sees a suspicious figure, who introduces himself as Drood, and appears to have a death touch for all� of the injured he encounters. But did Dickens see Drood? Or did he make him up, part of a writer’s game with his friend Wilkie? Or is he delusional? The relationships between Dickens, Drood and Collins is the crux of the story; Dickens is excellently portrayed as egotisitcal, always in control, genius bordering on madness with a passion for mesmerism. Collins is also egotistical, but self-doubting, highly dependent on laudenum (opium) for the pain of arthritis and gout, always in the shadow of Dickens’ genius, even when his books outsell the master’s. His rivalry with Dickens changes their relationship over the years, as he alternately worships him, thinks him mad for believing in Drood, believes that Dickens has sacrificed Collins to Drood for Dickens’ own escape, and then believes his rival needs to simple die. And Drood is either a reflection of Collins’ drug induced hallucinations; or a create of Dickens’ fears of the world and how mesmerism may be used for a full scale class riot; or truly an almost immortal madman, who easily puts others under his spell to do his bidding. Whatever the case, as with most Simmons’ novels most of this question is left up to the reader to decide. The supporting cast of characters, real (Dickens’ family, Collins’ mistresses) or imagined (the detectives that are Drood’s rivals, Dickenson who was ‘saved’ by Dickens at the train wreck), are as enjoyable as the main three. And, as with The Terror, the story again peaked my interest, so that I will go back and re-read the Dickens books and find the Collins’ books that he refers to. Simmons has a habit of pulling in Shakespeare, Dickens and other classics (ah yes, he was an English major) and somehow seamlessly putting them into the story. I applaud him for once again writing not only an excellent novel, well paced and interesting, but one that I’m sure had the marketeers trying to figure out how to classify it. Thanks, Jake. I just finished Black Hills by Simmons. Great subject matter, the ending kind of lost me. I’ll post a review on it soon.